I got introduced to Neelakanta , a mimicry artist through my another friend, Mimicry artist Mimicry Srinivas, a Guinness book record holder, through his TV9 program called Mimicry Mela. 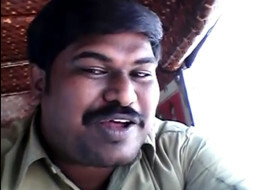 When I heard Neelakanta on that program, I became instant fan of him. A very talented, versatile artist who always tries various novel ideas and create his own brand. Last week I saw posting from him on Facebook saying because of his financial issues , he ended up selling his auto which is what he basically does for his living. He is now running a rented auto on double shifts to make his living and as a result he does not have time to work on his videos or pursue mimicry as carrier. That pinched me a lot. A great talent should not go silent because of personal issues. I spoke to him over phone to learn his need. He did not ask me a penny. A very humble and self respected individual. I realized some help towards getting some advance for his auto would be of great help. Say around Rs.75,000. But to give him better cushion , if we can buy him a used auto as well, it might be of great help. So I am willing to help him from my side but thought of asking my friends also if any of you would be interested to contribute to this good cause. Even your donation starts from $10/$20 also it makes a difference to his life. I would like to add $500 from my side. Hope you guys support me in this good cause. I would like to donate this money to Neelakanta to help him get his auto and some cash in hand to help him sustain and continue his efforts on mimicry side and produce more innovative videos.